Why does this work only in kitty? Simply install kitty. You also need to have either the git program or the diff program installed. 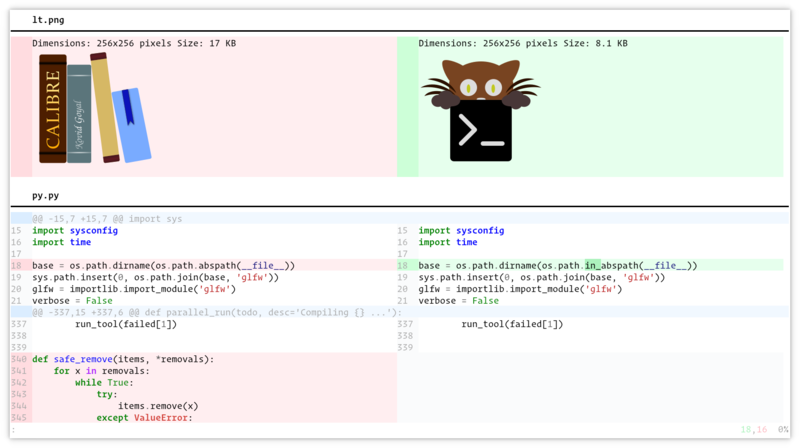 Additionally, for syntax highlighting to work, pygments must be installed (note that pygments is included in the macOS kitty app). to see the diff between file1 and file2. You can also pass directories instead of files to see the recursive diff of the directory contents. Scroll to next match >, . Once again, creating an alias for this command is useful. The diff kitten makes use of various features that are kitty only, such as the kitty graphics protocol, the extended keyboard protocol, etc. It also leverages terminal program infrastructure I created for all of kitty’s other kittens to reduce the amount of code needed (the entire implementation is under 2000 lines of code). You can configure the colors used, keyboard shortcuts, the diff implementation, the default lines of context, etc. by creating a diff.conf file in your kitty config folder. See below for the supported configuration directives. The number of lines of context to show around each change. The diff command to use. Must contain the placeholder _CONTEXT_ which will be replaced by the number of lines of context. The default is to search the system for either git or diff and use that, if found. The string to replace tabs with. Default is to use four spaces. The pygments color scheme to use for syntax highlighting. See pygments colors schemes for a list of schemes. Specify a path to the configuration file(s) to use. All configuration files are merged onto the builtin diff.conf, overriding the builtin values. This option can be specified multiple times to read multiple configuration files in sequence, which are merged. Use the special value NONE to not load a config file. If this option is not specified, config files are searched for in the order: $XDG_CONFIG_HOME/kitty/diff.conf, ~/.config/kitty/diff.conf, $XDG_CONFIG_DIRS/kitty/diff.conf. The first one that exists is used as the config file. If /etc/xdg/kitty/diff.conf exists it is merged before (i.e. with lower priority) than any user config files. It can be used to specify system-wide defaults for all users. You can download a sample diff.conf file with all default settings and comments describing each setting by clicking: sample diff.conf.